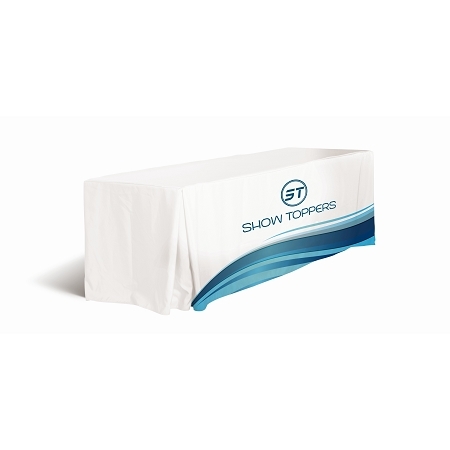 8 ft. Fitted Stretch Table Cover with open, zipper or closed back. 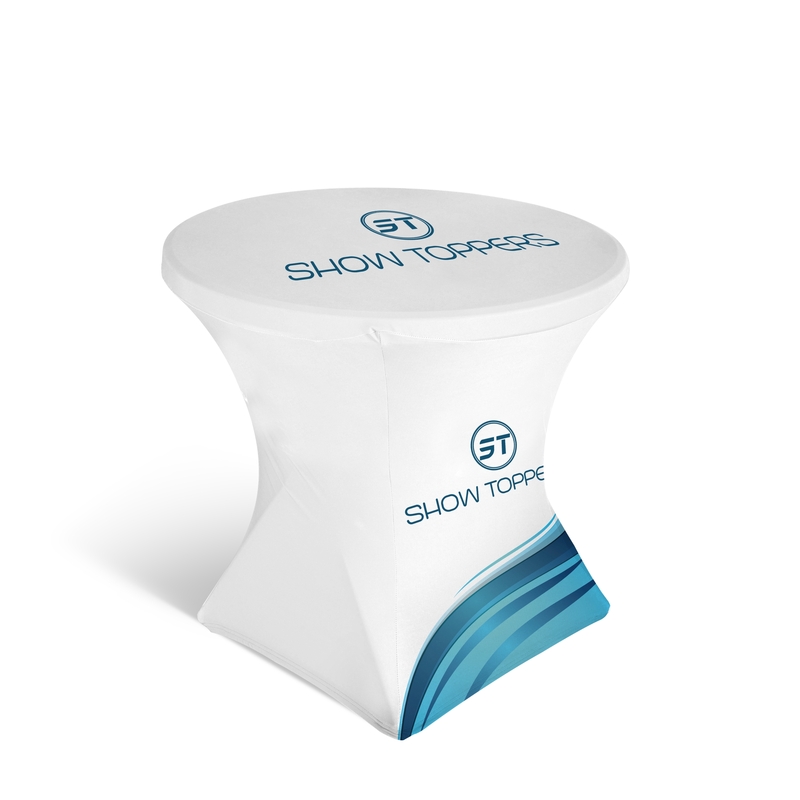 Our line of custom, full-color sublimation printed table covers are the perfect first step to creating brand awareness and getting your trade show booth or exhibit noticed. Stand out in the crowd with vivid colors and a perfect, professional fit and finish for any of your table specs. Don't see exactly what you need? We also do custom dimensions. Reach out to us for a quote at any time. Browse the entire line below, or use the handy sub-categories to filter your search down to just what you're looking for. 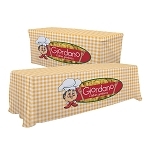 Why is a stretch table cover a great choice? Ever go to set up your event to find that the tables you are given are not identical. 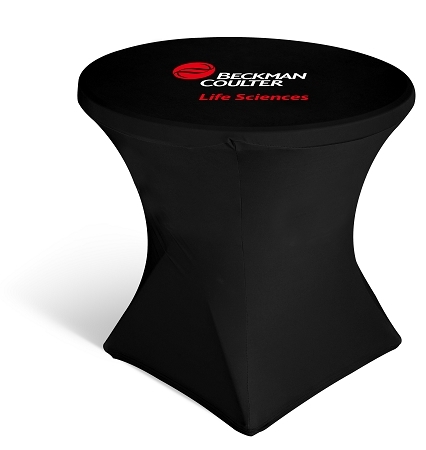 If you want to hide the flaws and imperfections in tables, than a stretch table cover is a great solution. No need to pin these in place like a throw table cover, no worries about wind at an outdoor event. the stretch fabric helps keep this fitted table cover from shifting. No issues with fitting makes this a popular and eye catching choice for corporate events, marketing campaigns, weddings, dinner parties, trade shows and any indoor or outdoor event that needs attention to detail. 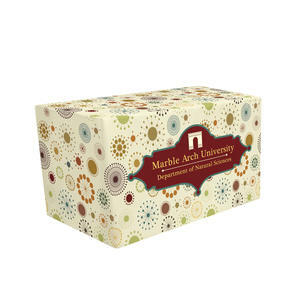 Polyester seamless stretch tension fabric table cover is vividly printed in full color to capture every detail of an intricate design utilizing dye sublimation printing. Choose open back for legroom and easy access to storage. Choose closed back for storage privacy. 5 to 7 days after proof approval for quantities below 20 pieces. Rush service may be available. 7 days after proof approval for quantities below 20 pieces. 15 days for qty 20+ Rush service may be availalble. 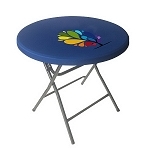 Round Fitted Stretch Table Topper - 24"
6 ft. Table cover - Pleated, open or full back. 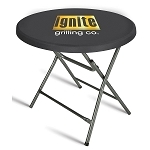 Round Fitted Stretch Table Topper - 37"